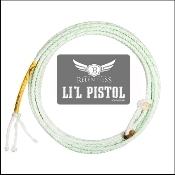 Softest and smallest kid rope made by Cactus Ropes. It's perfect for playing inside leg, or as your toddler's first rope. World Champion Trevor Brazile's son, Treston, uses and endorses this rope.